Stephanie J. Block's debut CD, This Place I Know , includes Wicked's "Making Good" song. Stephanie J. Block's debut CD features vocal or musical collaborations with all of the songs' composers, including Wicked composer Stephen Schwartz who accompanies her on "Making Good" from earlier versions of Wicked. Also on the album are Stephen Flaherty, Deborah Abramson, Scot Alan, Zina Goldrich and Marcy Heisler, Andrew Lippa, Paul Loesel, Steve Marzullo,Claude-Michel Schonberg, Dolly Parton, and Marvin Hamlisch. BUY Stephanie's This Place I Know . This unique recording will be a treasured favorite of musical theatre fans for years to come. Block said that recording "Making Good" with Stephen Schwartz for the album was "such a great experience that I immediately felt that it's what I needed the CD to be." She explains that the version on the CD is not just with Stephen at the piano. "We decided to use a similar, more souped-up arrangement to the one we came up with for the Wicked fifth anniversary celebration." Download "Making Good" from the Wicked cast album. Defying Gravity: The Creative Career of Stephen Schwartz, from Godspell to Wicked, includes a 150-page account of Wicked came to life. The book shows Stephanie's essential role in the early readings during the show's development. She was the first to sing "Defying Gravity" and other songs for Elphaba. The book includes over 200 photos and illustrations. Also learn about the song "Making Good." Stephanie J. Block joined the Broadway company of the Stephen Schwartz musical Wicked in the role of that green-faced witch in October, 2007. 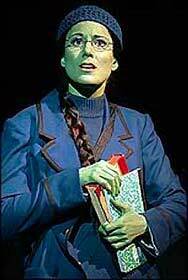 For her earlier performance as Elphaba for the Wicked Tour March 2005 - March 2006, she received the Helen Hayes award for her performance. BUY Stephanie's This Place I Know Debut CD. About her solo album: Stephenie wrote in her website news from June 2006: "I have begun recording 'the album'. Stephen Schwartz and I went into the studio last week and laid down "Making Good". Stephen is at the piano and it was a thrill to sing with him again. There's something really magical about a composer playing his/her own music. I am so grateful for him entrusting his (as he puts it) "murdered darling" in the care of my voice." However there doesn't seem to be any sign of it being available yet. Her website is www.stephaniejblock.com/ - It includes bio, audio clips from her demos, etc. so you can hear her beautiful voice. Every musical theatre fan has his or her list of 'Favorite Moments' from shows or performances. In February of 2002, my personal list of such moments found a new entry at a special tribute night for Stephen Schwartz held at the Pasadena Playhouse. This loving tribute, produced by the Musical Theatre Guild and ASCAP, hosted by the exuberant and consistently witty Jason Alexander, was a veritable feast of Schwartz songs culled from his numerous shows and films. Various stage luminaries made appearances including Liz Callaway, John Rubinstein Teri Ralston and Alexander himself, amongst others. However, my new 'Favorite Moment' came toward the end of the evening when it was announced we were going to be treated to a brand new song from a then-in-progress musical called WICKED. While I had heard of the musical, the song "Defying Gravity" and its singer Stephanie J. Block was, of course, uncharted territory for this Schwartz fan. Our congenial host then informed us that the on-stage band, didn't know the number. "Does anyone know this song?" pleaded Alexander. With that, the honoree of the evening quickly made his way up on to the stage and with a warm reception from the packed house, took his place at the piano. A spotlight then caught a striking, dark-haired women stage left, as the composer began playing the song's fetching opening vamp. Ms. Block proceeded to sing this incredible song about defiance and personal liberation. The combination of Stephanie's powerful but graceful voice, the mesmerizing song and the passion with which its composer accompanied her, provided the crowd with a goose-bump-raising thrill ride. By the time we reached the song's climatic conclusion – "…no wizard that there is or was, is ever going to bring me down!" – the place went wild, with cheers, whistles and heartfelt applause. I too applauded and cheered, smiling broadly and quite moved by this moment that I knew had made The List. I, for one, am delighted Ms. Block is Elphaba for the tour and can only hope audiences will experience the same visceral thrill I did that night in California. To the main Wicked page. Wicked Songbooks and choral music if you want to sing "Defying Gravity," and other Wicked songs. Now your choir can sing "For Good" - See choral music on our sheet music page.